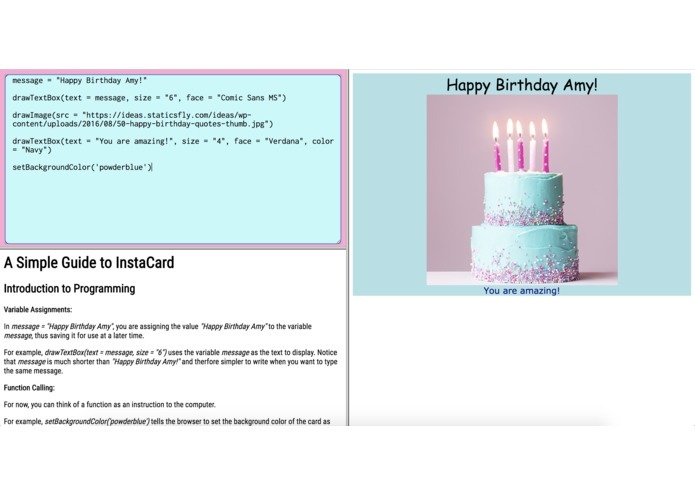 Create a birthday card using an easier version of HTML! We wanted to help girls to get a sneak peak into basic programming concepts through card (or any visual!) making, which we noticed that a lot of our female friends love. We first built a realtime HTML editor to test if our idea is manageable within the short amount of time, and then we moved into designing the language and parsing the 'code' into HTML for it to display on the browser instantly. Finally, we worked on displaying documentation for the language so that the users know exactly what can be done here through coding. We are proud of the fact that the code parsing portion and the real time editor work seamlessly with each other.